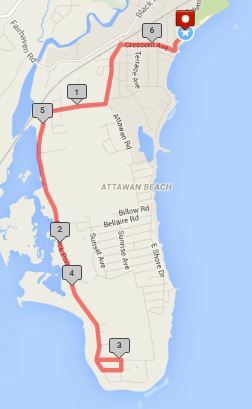 The Niantic Bay 10k is an out and back course, that begins at McCook Point Park and makes its way through the Crescent Beach neighborhood, then into Old Black Point. This scenic route is mostly flat and includes beautiful views of the Niantic Bay and local beaches, a great run to kick off the summer! Post race festivities will be held at McCook Point Park, include food and water and an award ceremony. Proceeds from this race benefit East Lyme Youth Services, and enables them to offer a free after school program daily throughout the school year. Location: Registration and start at McCook Point Park, 8 Atlantic Avenue, Niantic, CT 06357. *First 150 participants will be guaranteed a race shirt, sizes not guaranteed! Download and print the form below or complete the form in the event promotion flyer. Note: “NB10k” in memo portion of check. All paper applications must be received by Tuesday, June 4th. In-person registration and check payment accepted from 4:30-6:00 PM. The 10k course starts just outside the McCook Point Park entrance on Atlantic Street. The course will continue from Atlantic Street, left on Bayview Avenue, right onto Crescent Avenue and left on Black Point Road, taking a right at the stop sign onto Old Black Point Road, continuing through the gates of Old Black Point, following around Old Black Point Road, taking a left at the stop sign onto Great Wight Way, and a right back onto Old Black Point Road, and returning to McCook Point Park via the same route. The course is marked. The Niantic Bay 10K is hosted by East Lyme Youth Services and Parks and Recreation. All proceeds from the event go toward supporting the Open Center Afterschool program which is available to all middle school students daily throughout the school year at no cost. Contact Mike McDowell at 860-739-6788 or mmcdowell@eltownhall.com with questions.